My Mind's Eye: Lil' Robots & a Give-away! I've been a fan of My Mind's Eye ever since I started scrapping in the dark ages. In my opinion, their designs and color combinations are innovative, distressed perfectly and just a little bit funky. It isn't easy to find papers for boy themed pages, but My Mind's Eye Lil' Robots is a perfect line for all those boys in your life. 1. How versatile this line is. It works for little boys as well as bigger boys thanks to the colors. There are bright and happy colors mixed well with darker more serious colors. 2. Double-sided papers. I love getting my money's worth! 3. The weight of the papers is heavy enough to use as a background. 2. There isn't an alphabet that comes with this collection. I'd love to see an alpha with nuts and bolts! 3.There were quite a few die cuts that said Little Robots. I had trouble imagining myself using them. 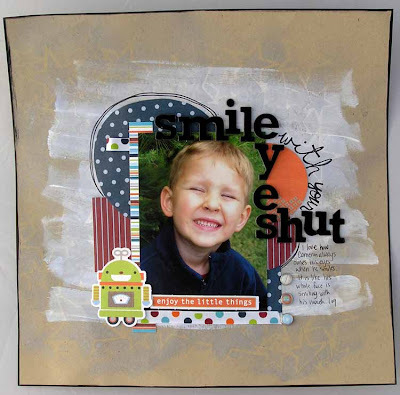 I started out with a layout, Smile with your Eyes Shut with simple layering. Because all of the papers in the line coordinate so beautifully, this layout come together very quickly. In my second layout, Cute Visor, I took full advantage of the die cuts and used them as layering embellishments. Finally, I quickly put together a cute card using the patterned paper, brads and die cuts. If you're looking for a great line for your boys, no need to look further! This is a great line that is not only fun to work with, but also surprisingly versatile. What do you think? Do you like the funny little robots? What about the patterns? Can you see yourself using this line for your older boys as well as your younger ones? Leave a comment by midnight EST Tuesday to be entered to win a Lil Robots prize pack from My Mind's Eye!! That looks great! I would love to have some boy paper! Your layouts are super cute! I really love the packaging the ribbon comes on! I think this line is absolutely adorable! Perfect for my toddler. And I'm thinking perfect for when my new boy arrives this fall. Big brother/little brother layouts and such. ooooh I love this line!! I have 2 boys and have a terrible time finding co-ordinating lines to work with. Thanks for the chance to win!!! Until last August, I'd always been a shabby, feminine, vintage type scrapper. Then my daughter gave birth to a wonderful little boy. Now I am having a blast scrapping with little monsters, skullies, & robots. I love this collection! Darling layouts and cute cards! This is a really cute line! Thanks for a chance to win! I love boy paper packs. I have not used this particular one. Great job with your layouts. Always on the lookout for great boy paper for my nearly 4 year old. Thanks for the chance to win! I don't even have kids, but I can totally see myself using this for cards and other fun projects! It's just a fun collection! Super cute stuff! Thanks for sharing! this line is perfect for my little boy!!!! plus the colors are great and i'm totally about color!!!! MME is one of my two favorite paper companies. They have never came out with a line that I didn't like. Even though I have girls, I could totally see myself using those robots papers for girls. They are just too cute! My 3 year old loves to draw robots! This line would be perfect to showcase some of his artwork. Such a fun line! I t would be perfect for my little boy! Cute! I think these would work well with my pics of Little Man. I have a daughter and very rarely use anything this boyish. I have 4 nephews and this line would definitely inspire me to scrapbook them for a change! Love it! I especially like all the gears. always on the lookout for great stuff for boy layouts: I have 3 sons, and they don't like flowers!! :) thanks for a chance to win! Oh, I totally agree!! I love sheets of diecuts, but I hate having to cut all those little dots off. I'd almost rather the diecuts came in a package so they wouldn't have those stupid dots. What a cute line! I would certainly use it to scrap my little boy's pictures. I think it would be super cute with my little boy pages! I love the colors!!! I have to get this line! I've older boys in robotics and this would be terrific! I can see it now :) Thanks so much. I like this line too! I have lots of little boy pictures to scrap from when my boys were young! Love the smile with your eyes shut layout! How fun!! I really like this! YES, this is a fabulous line! LOVING everything MME is putting out lately, and this is no exception. the colours are yummy, the patterns just POP, and i love how you've used all the die-cuts! way cute. 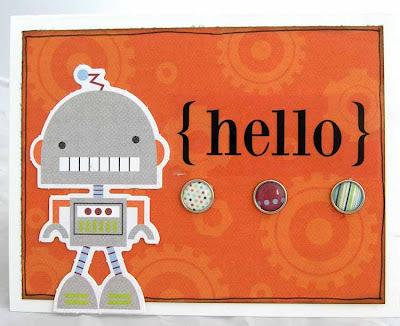 i can see myself using this with some of the cute BamBots images and creating a little robot party on my cards! I LOVE this line! What a great addition for scrapping my son it would be! Your LOs are so wonderful. Great inspiration!! I LOVE these papers and I LOVE what you did with them! Very cute! Love how you took these elements and applied them to cute "general" boy pix. you didn't limit the embellishments to only the event where toys and robots were used. I think could use this pack this way too. LOVE this line! I can totally see me using it for my son. What is it about boys and robots - they are both so adorable! I think this is one of the cutest lines ever, and I don't even have a little boy! I just like them because they are cute and funky! Who wouldn't love to play with some of these??? I have been eyeing this line for photos of my two boys! Love it! Love the Little Robots for my young boys 8 and 13. Not sure if I would use it for my DH though. Very cute though. This is such a great boy line (and for those tomboys too). Can't wait to be able to use it in my layouts! Always love MME!! This line is perfect for my 6 yr old boy photos! (he's 6 years old, not the photos are 6 yrs old) lol!! Love them! I have been using robot stuff for my guy! I have a 10 month old and these papers are perfect for him. I don't think I would use them on layout for boys over 10 years old though. Love it! This is a very fun line from MME. I have two sons who are 7 & 5 and I know they would love to have a card or scrap pages with these robots. I also believe you would be able to incorporate it for the older boys. God bless! Wow! These are perfect papers for projects for my grandsons. Thanks for sharing your creative ideas. Kudos for coming up with some cute boy paper-- can always use more of it! I could totally see doing a scrapbook page featuring my son and his LEGO collection - the robots would be perfect! Love the brads! I love this line! I have boys that are college aged and I would use this for them! Love it for boy pages! I always struggle to scrap my godson's pics. Thanks for the chance to win! aaahhhh finally come cute boy paper!! My boys are 22 and 21, and I desperately need to work on their scrapbooks...but I find it so hard to find boy paper to get me excited to scrapbook. Thank you very much for your review!! I have a 4 year old son so this paper looks like it would be perfect for layouts of him (my main scrap subject). I could definitely see myself using it. I would definately use this paper for all the men in my life!!!!! That paper would be so perfect for pages for my two little boys! Such cute boy colours too! Oh this line is so adorable! I love your layouts and card! What a cute collection! This is on my must-have list! i love the way you painted on that lo, looks great!!! I always find it hard to look for boys pps and embellishments and MME's Lil' Robots collection is really perfect to make a boy layout.I have three boys and have lots of photos of them. super cute line! gotta love robots! It's a very cute collection! I've got plenty of little boy photos this would work with. Super cute layouts. This is such cute boy paper. Cute collection. I would use that for all my boys baby years pictures that I have yet to scrap! What a fabulous collection...love the colors! I wasn't a much of a fan at first but after seeing what you did I can see this is more versatile than I first thought. Thanks for the ideas. I love the robots!!! As a Mom of two boys I find there is a lack of masculine and boyish products out there so I think the collection rocks!!! That is an adorable boy line. Will have to show it to my friend, she has a cutie patootie grandson and uses boy stuff like crazy, lol. Thanks for the review. I would love to win this to make some cute layouts of my cute boys! I LOVE the colors in this line. I am also a fan of small "tight" patterns. I scrapbook for my Godson as my 'special' gift from his Godmother. This would be perfect for some of his layouts. What a great line. I just had a little boy and I haven't stocked up on alot of boy items so this would be perfect. Thanks so much for the chance to win. I love to make thank you cards for my students and boys just LOVE robots. I look forward to creating with all of these papers, ribbons, embellishments, and die cuts! What a great line. Perfect "boy" colors. So fun! I agree with you about the alphabet. How fun would that be? Completly Agree...These cute little robots are outt this world! The Lil Robots would be great for small children. Can't imagine using for older boys. Very cute! My boys are 8, 7, and 5 and are loving anything and everything robots right now. I just got the new Robotz Cricut cartridge that I would work really well with this line (and it has a cute font). I love the color scheme! totally love this line! I have some stuff from it already, but would love more! (and i'm sure my sister in law would love it too, as i like to share:)! I hadn't seen this before! I would love to work with this line..great colors and patterns! adorable line. I think the die cuts with little robots might be hard to use, but I am sure I could think of something. and scroll down to the middle of the page you'll see a 2pg LO of my adorable grandson Gavin Liam. I would love to win this. It coordinates well with the Cricut Robotz cart.